The Norristown Hose Company received its’ charter on February 22, 1848. The first meetings were held at the homes of its members. Towards the end of 1848, the company purchased a lot at 417 Dekalb Street and built their first firehouse. In 1881, the corner lot at Dekalb and Chestnut Streets was purchased, and their second and current firehouse was built. The building was dedicated on September 15, 1883. In the early years, the company would receive $400.00 annually from Town Council. It was used primarily to purchase hose, since the company was a hose company. In the summer of 1848, the company purchased its’ first hose cart that they called “The Crab”. Over the years, they purchased a steam engine; an Amoskeag Pumper. It was first drawn by men, then horses. In December 1917, the Norris Hose purchased its’ first completely motorized vehicle. Throughout the 20th century other motorized vehicles were purchased including a Simples, an Ahrans Fox and a Hale Pumper. At the present time, the Norris Hose fire fighting apparatus consist of a 1992 KME Pumper, purchase by the Norris, and a 2001 American La France Quint, purchased by the Municipality. 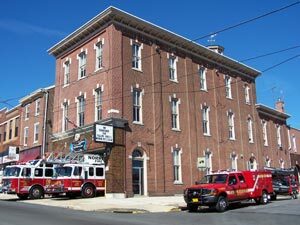 The Norristown Hose Company was the first fire company in Norristown, and to this date, continues to serve the Norristown Community with career and volunteer fire fighters, and a Ladies Auxiliary. 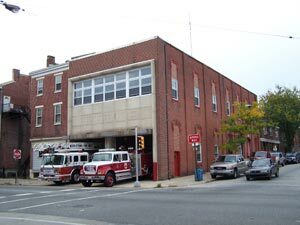 On Monday, November 22, 1847, citizen’s of Norristown met and formed the second oldest fire company in Norristown. It was called the Montgomery Hose Fire Company. They built their first firehouse on Penn St. near Swede St. A few years later, they moved into a new building on Penn St. closer to Dekalb St. Today, the company is housed on Freedley St near Pine St. Through out the company’s history, the firefighters responded in many types of apparatus. In 1853 town council gave the company the Pat Lyon, a hand drawn pumper, which is still preserved in the firehouse today. In 1890 two dark iron grey horses were purchased to pull the apparatus. In 1911, the company purchased their first piece of motorized fire apparatus, a combination chemical and hose truck. Today, we respond in a 1997 KME Pumper, a 1988 Hahn Pumper and a 2002 Ford F350. We also preserve the company’s 1957 Mack Pumper. Equipment has also changed. In 1942 the company purchased two Indian Tanks for possible use against aerial bombs during WWII. Today we have radiological monitors and thermal imaging cameras. Although many things have change, the nucleus of this organization, “To Save Life and Protect Property” has not changed. Through liberal contributions from our citizens, and appropriations from city and state government, our company has grown and thrived. We thank you and proudly continue to serve the Citizen’s of Norristown. On Tuesday, July 27, 1852, in a meeting at the Norris Hose Company, A. W. Bertolette, along with the Chairman of the Constitution and By-Law Committee, presented and adopted the first draft of the Humane’s Constitution. Members officially adopted the name Humane Fire Engine Company No. 1 of Norristown, Pa. The name Humane was selected because the committee purchased their first piece of apparatus from the Humane Fire Company of Philadelphia No. 1. With Philadelphia having a paid fire department for over 100 years now, the old Humane of Philadelphia went out of existence. On September 11, 1852, a proper reception of the apparatus acquired from the Humane of Philadelphia took place with a parade that started at Main and Ford Sts. It was recorded that a member of the Humane of Norristown carried the American Flag which only had 31 stars on it. Unfortunately, in 2013, due to a lack of volunteers, the Humane had to close its doors. The few remaining members were moved to the Norristown Hose Company. The Fairmount Engine Company #2 was established on February 22, 1852, in the office of what was then McCarter’s Machine Shop, located at Washington Street and Strawberry Alley, shortly after the falling of the evening shadows, there gathered a company of men well known in Norristown at that time. Stirred by the success that attended the other companies, the Norris and the Montgomery, and feeling that another company would be a great benefit to the department, this meeting had been called for the purpose of organization. In 1864, a new fire hall was built on Lafayette Street just above Cherry Street, and occupied in the fall. On November 12, 1874 a lot of ground was purchased on the corner of Main and Astor Streets. The building was dedicated on May 1, 1880, and it is our current location to this day. The Fairmount Engine Company #2 currently houses two apparatus and a marine unit. The trucks consist of a 1995 110 foot E-One Aerial Ladder, a 2001 E-One Cyclone Heavy Rescue and a 2001 Ford F-450 Super Duty Marine Unit that tows two Zodiac Boats. 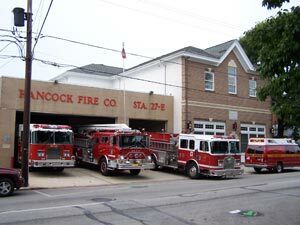 We cover the entire Municipality of Norristown and the surrounding communities with our ladder truck and heavy rescue. We also cover a large portion of the Schuylkill River and other waterways with the marine unit. Brotherhood, peace and harmony as mentioned since 1852 still dwells in our house. Of course, like any family we do disagree at times, but never to a great extent because we are all brothers. Even our families, in time of trouble, will call on the Fairmount, and know that our men and women will be there to lend assistance. Be it time of mourning, to a child locked in a garage with keys in hand, our men and women are there. Our organization consists of a group of dedicated men and women that respond to over 400 emergency calls a year; ranging from a small house fire to a complex technical rescue. If not for the hard work and dedication put in by these men and women for over 150 years we would not be living by our motto: “Prompt To Action”. Each year we grow stronger with honor, commitment and dedication to our fellow men and women, as well as the community we serve. Strong leadership and training will set the course for the future Fairmount member. Forward we go: “Prompt to Action”. The Fairmount ladies Auxiliary has been in existence for over 85 years! They currently have 50 members (Honorary, Active and Junior). Of the 50 members, half actively participate in fundraising events and/or meetings. Their purpose is to support the Fairmount Engine Co. #2 anyway they can. In doing this, they in turn support the residence of the Municipality of Norristown and the surrounding areas. They host many fundraising events throughout the year. Some of these events include lunches at the fire academy, two Basket Bingo’s (in partnership with King of Prussia Ladies Aux. ), annual Easter flower sales, lottery calendar’s, selling food at the St. Patty’s Day Parade, homemade apple cake and pie sales at Easter and Thanksgiving, to name a few. The money that is raised is used in various ways. The most important is purchasing equipment for the trucks and for the volunteers so that they can do their job safely and effectively. The Junior Auxiliary Program is for girls who are 16 years old and want to volunteer and help out in the community. They help at our events, participate in the parades and attend monthly meetings. There are currently four junior auxiliary members. Junior auxiliary members are not required to pay dues until they turn 18; at that time they will be proposed under the general membership. It was back on November 21, 1895, the Hancock Chemical Fire Engine Company was formed. The name of the company was adopted as a tribute to General Winfield S. Hancock, a resident of Norristown who was a distinguished general during the civil war. The number 5 was added to the name and it was under this designation that a charter was granted to the company on January 20, 1896. By an amendment to the charter in 1921, the name of the company was shortened to The Hancock Fire Company. In November of 1895, when the organization was formed, the following officers were elected: Thomas Neale, President; Henry Kratz and Jerry Larzelere Jr., Vice-Presidents; Charles Wainwright, Secretary; and Harry Stallman, Treasurer. In December of 1895, the Location Committee recommended a site at Airy and Stanbridge Streets for a firehouse. The owner of the plot was John Hagg, and the price was set at $3,000.00. The company also voted to purchase a chemical fire engine from the Charles T. Holloway Company of Baltimore at a price of $1,600.00. With a chemical engine a fire could be extinguished with a minimum of water damage. It was in January of 1896 that the constitution and by-laws were adopted. A few months later in April of 1896 the company purchased a pair of horses for $275.00 and hired a driver, George Sechler, for $8.00 a week. Finally, in November of 1896, the new building was completed at a cost of $3,907.46. It was dedicated on Thanksgiving Day. It was not until September 1903 that the building was remodeled; installing sanitary sewers and electricity. In July of 1913, the apparatus committee was given permission to purchase a double 80 gallon chemical engine from American LaFrance for $5,700.00; and in November of 1923, a service wagon for $2,250.00. The first smoke masks were donated by the Water Committee of the Borough of Norristown in September of 1933. In March of 1987, new bays were constructed to handle the weight of more modern apparatus. In September of 2002, the old firehouse was demolished, with the exception of the newer bays, to make room for a more modern and energy efficient building. It was completed in October of 2003. The firehouse currently houses a 1989 Mack Squrt, a 1997 KME Pumper and a 2003 Spartan Utility Service Unit. The Hancock is not only involved in fire fighting, but participates in many other public safety events. We pump out basements, supply lighting at various functions, assist police and EMS, and assist other organizations raise money. As you can see, the Hancock Fire Company has a long history. It has been here for over 100 years, and plan on being here for another 100 years. This will only occur if we continue to get dedicated volunteers serving as fire fighters and administrators. Hopefully, the generations to come will work hard to honor the name and traditions of the Hancock Fire Company. Norristown Fire Police Association, Inc. 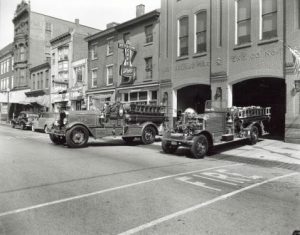 The Norristown Fire Police Unit was formed in 1922 and reorganized in 1942. They held their meetings in the City Hall Room of the Spanish War Veterans Building. 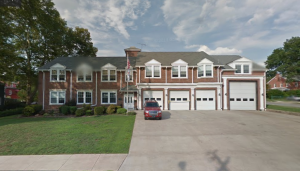 On Thanksgiving Day, 1943, they “Housed” their first Fire Police Car at the Norristown Hose Fire Company. Besides the car, the equipment consisted of 1000 feet of rope, picks, shovels, crow bars, jacks, a first aid kit, lights, lanterns, blankets, a tarpaulin and other articles which might be needed by the unit at the scene of a blaze. At that time the Fire Police Unit consisted five men from each of the five Fire Companies in Norristown. It served at virtually all fires, roping off streets and maintaining order so that the firemen were not handicapped by spectators. Before 1978 the Fire Police Unit consisted of only men. Today our unit consists of men and women, who perform a good job of protecting the firefighters and assisting police departments. In January 1980 the unit incorporated and is now known as Norristown Fire Police Association Inc., Its current membership has members from four of the five companies, and a traffic unit that is housed at the Hancock Fire Company. The Association meets the 2nd Monday of each month at 7 P.M. Any member of the five Norristown Companies can join. If you feel you can no longer fight fires, but want to stay active, come join us. On April 22, 1974 a charter was granted to ten men by the International Association of Fire Fighter’s thus creating I.A.F.F. Local #2335. As times changed along with the amount of fire calls, the men began to realize the need for a common ground with regard to qualifications, training, along with salary and benefits. On February 4, 1975 this organization was officially recognized as the exclusive representative for all full time paid fire suppression personnel, and that all these fire fighters are employees of the Borough of Norristown. While beginning with ten men the organization has eventually grown to its current size of sixteen, (twelve Fire Fighters, three Battalion Chiefs, and a Fire Marshal). There are a minimum of four on duty at any given time, up to a maximum of seven during the normal weekday, this includes the Fire Chief, who although not a member of the Union is also a full time employee available to immediately respond to any and all calls with the much needed help of our dedicated volunteers. The Career Fire Fighters are civil service employees of the Municipality; many are former volunteers of the Department.